Launch Of New Ford Corsair. Launch Of New Ford Corsair..1963..01.10.1963..10.01.1963..1st October 1963..Today saw the launch of a new car to the market. At the Smithfield Motor Company in Drumcondra, Ford launched "The Corsair".,The Corsair was one of the four model Consul range, and shared many of its mechanical components with the Cortina, Classic and Capri. 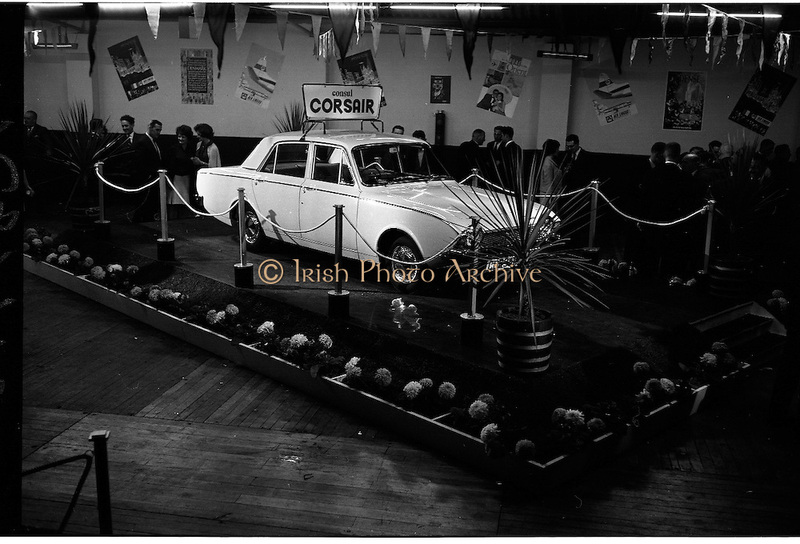 The Corsair had unusual and quite bold styling for its day, with a sharp horizontal V-shaped crease at the very front of the car into which round headlights were inset...Image shows the New Ford Corsair on the display stand at the Smithfield Motor Company in Drumcondra.